IG need to increase the margin so that the few people that are currently long can't hoard all the available crypto contracts offered by IG. Increase the margin significantly so more IG users can get a position when they need to. Go to 50-80% margin so we are mostly using our own money. All the current open positions are on mostly borrowed money with small deposits. At least put a maximum contract limit per user. Reading all the previous comments, it's obvious people are turning away from IG and looking elsewhere. Best solution is to increase margins and/or limit the number of contracts. One last thing.... 25% interest, plus 7.5% admin fee on long positions is pretty outrageous. Good luck to the lucky few IG users who are currently holding. Hi - I'm sorry that you feel that way, however I can assure you that you are categorically incorrect. We not take a speculative position because we don't know which way the market is going to go, and we are regulated by the relevant financial authorities in the locations we have clients. I think in this instance if you are looking to discuss how we operate, or would like to discuss a specific trade, then please give us a call. Hi - these are some great ideas and we have actually implemented many of these. 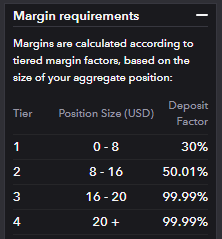 You can see how we've changed the margin requirements below, as well as limit clients to a $250,000 notional value across all crypto asset types. In regards to the margin requirements, although we have recently raised these they are still significantly cheaper than the competition, and you'll be able to see the following table* on IG.com today. Furthermore you will receive 17.5% for shorting. This should create more two way business and increase the probability of those those who are looking to go long to be filled. We are also looking at futures on the CBOE and CME to help with this. 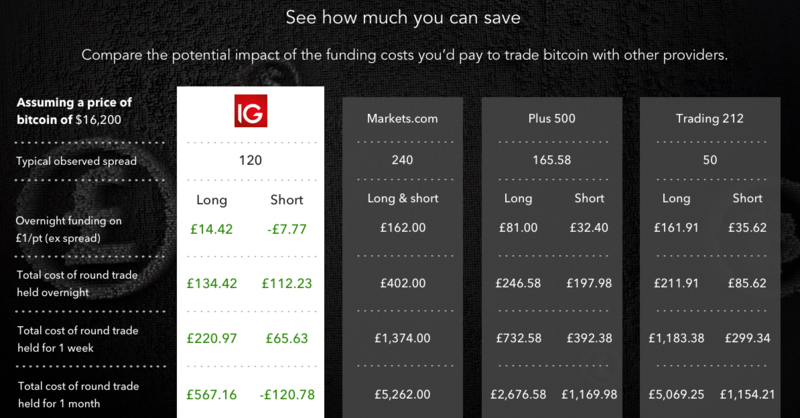 * Figures are based on a notional value of £16,200 representative of a £1/pt bet when bitcoin is priced at 16,200. Data is based on analysis of bitcoin offering from prominent UK competitor websites and is correct to the best of our ability as of 21 December 2017. Table for comparative purposes only and may not include all charges from alternative providers such as weekly rolls. Negative values on IG's short reflect clients receiving. Data is subject to change. Spread observed on platform. Oh I didn't realise those on 16+ contracts were already on 99.99% margin. Now to free up some more longs, lets jack up contracts sizes 1-16 to 99.99% margin too. Do those on 99.99% margin still pay 32.5% interest on the total position? I'm pretty sure you get charged for the full market value on regular shares and index positions, regardless of your deposit/margin. Thanks correct, you would be paying funding on the full trade even if you're margined at 99.9%. This obviously dissuades those who hold huge positions on crypto with holding them with IG, however from another perspective it may still be advantageous to holding the underlying. You would be dealing with a regulated UK listed company (IG), as well as not having wallet risk, the technological learning curve, or indeed the capital gains tax implications as you're spread betting. If you realise profits on bitcoin in the underlying market then you generally would be subject to CGT anyway at ~20%*. All in all, when looking at the competition and a number of other factors these values seem proportionate. All my long positions with Bitcoin, Ether, Bitcoin Cash have been closed (and the profits!) by the "Dealer" today at 9:48 with no clear reason. Hedging activities in JPY are building up as the Golden week in Japan approaches. Japanese markets will be shut for 10 days from Friday’s close in occasion of the accession of the new emperor to the throne.